Vandag was de jaarlijkse bijeenkomst van de Benelux QRP Club. Ik heb genoten van het programma en het ontmoeten van vele QRP vrienden. "Snelle en nauwkeurige verzwakker van 40 dB voor QSO's", te spreken. Het was een zeer gezellige dag met een goed verzorgerde catering. I received a very nice and very interesting e-mail from Stefano IZ1OQU. I'm IZ1OQU and my name is Stefano, from Italy, and I'm writing you to thank you for the attenuators that you have so simply and clearly explained on your website. 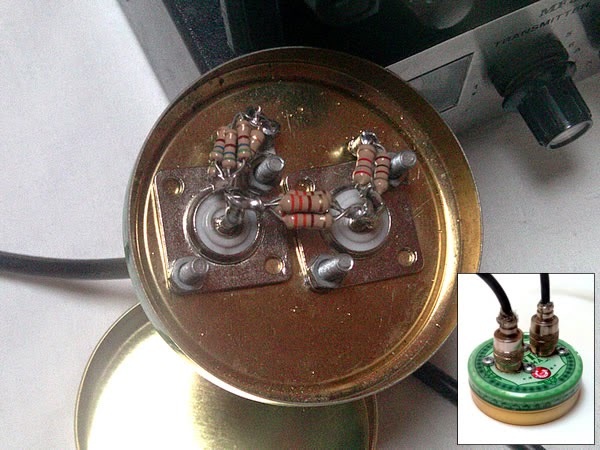 I built one, 10 dB, for my SSB DXing activity. It's really fantastic and I wonder how people can receive me with 50mW SSB! I tryed on 20, 12, and 10 m bands with same good results, with three top-qrb of 2300 kms (Russia, Finland and Georgia). Everything under 2000 kms it seems easy to reach. I use vertical dipoles, so not that big antennas even though they are full-sized for their bands. I'm gonna build a 20dB attenuator to reduce more! Thank again for your job. I designed the 10dB attenuator for 5 W of max input power. 5 W is the output of Yaesu FT817. You know: it has 4 switchable fixed power outputs: 0,5 W - 1 W - 2.5 W and 5 W.
With 0,5 W and 10dB attenuation, I can have 50mw. On 5 W, it falls to 500mW which is the standard low power - usually enough for many European QSO's. The 5 W design let me switch on all the 4 power output even though it needs more resistors to handle the power. I could use bigger resistors of 2 W, but the only shop around here is not well supplied for values over 1/2 W.
Stefano used the Power Attenuator Calculator from the PA1B QRPp page to design his attenuator. This Calculator is developed to design Power Attenuators for 5 watts or more, built with resistors of a modest power, such as 1/4 W or 1/2 W.
I am very pleased to answer the questions that Stefano had. Thanks Stefano for the questons. QRPpp is the (not official) term that I use for a power of less than 100 milliwatt. Here is a nice diagram on QRPpp, QRPp and QRP. How is it possible to use QRPpp?